"Love the Life you Live....Live the Life you Love!" Old School Sicilian punk rocker turned Father/Grandfather, traveler, chef, artist, tattoo artist, writer, back-country adventure/kayak tour-guide, Social Anarchist, Beanbag Politician, veg-head, organic dirt-monger, kick-back, mellow dude with an intense, passionate edge. I Love hanging out with new, interesting people. I Love showing people around this beautiful island. And, I LOVE to cook awesome, organic, healthy (for body, mind, and soul) food! I prefer small gatherings over large crowds. I surf, hike, camp, surf, kayak, surf, swim, dive, surf, spear-fish....And, I especially Love to surf!....Did I mention surfing?....Yeah, I Love that! I grew up in Long Beach, California on the East siiiiide!....After high school, I explored the World (in reality), as well as the far reaches of Outer Space (in an alternate reality). Then, upon landing back on Earth and graduating culinary school, I took up an apprenticeship as a Tattoo Artist...A profession that has taken me everywhere....Like where I am now, on the beautiful island of Kaua'i! I Love Kaua'i like I Love my own Mother...her beauty, her people, her culture, her lore, her history....All encompassing. I have Lived on Kaua'i for over 10 years, and on O'ahu for 10 years before that....After selling my tattoo studios on both islands, I decided I needed more playtime in my Life.....I have now been in the Tour business for most of my 10 years on Kaua'i, and Loving every second of it!.....Why?....Because, it's ALL playtime with cool, amazing people like........well.....like YOU! I'm ALWAYS down for a new adventure! Let me take you on one!.......Or, six! We did this tour as an alternate to our planned Jurassic boogie board tour (weather did not permit!) and we threw in a few other things as well. Our day with T (and Jennifer) was one of the best on the island! Loved hearing about local life and characters from T, plus eating one of the best bean burritos I've ever had! Tara is an awesome woman, as we'll as a fun, knowledgeable guide. She immerses herself deeply in any part of the planet you might find her on. 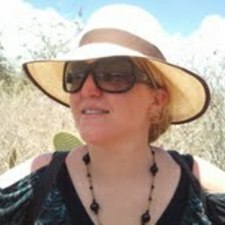 Tara can tell you all about the culture and cacti in Taos, or about the history and Monk Seals of Kaua'i. All that Tara is, is definitely worth your time, energy, and money! Aloha Nui, Tara!